You've seen Coit Tower and the city views. 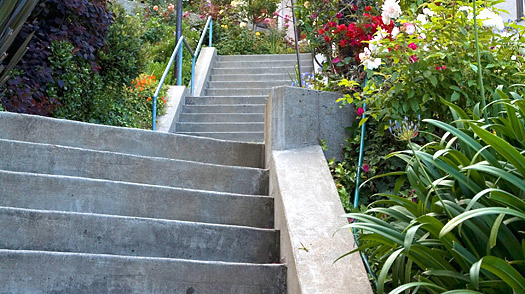 Now it's time to take the stairs down  all 400 of them! It's worth it because, along the way, you'll get to see some beautiful houses, gardens and, most times of the year, brightly colored flora. Also, it's all downhill (if I were sadistic, I could have easily made this tour go the other direction). As you walk, keep a lookout for the wild parrots you may have seen in the wonderful documentary The Wild Parrots of Telegraph Hill, which, as the name suggests, is about birds that live on the hill. Walk all the way to the bottom of the hill, then head east toward the Bay, to the Embarcadero, where you can pick up the trolley.